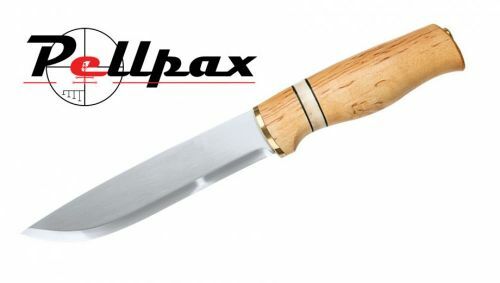 This high quality knife has many features that would attract any knife enthusiast. The high quality finish and pure power this knife offers comes in a neat package. Come complete with a leather sheath The Sylvsteinen is a handy tool as well as a neat display piece. With and overall length of 9.6" this huge knife weighs 5.30z which makes it easy to transport. The Blade measuring in at 5.3" is forged with Triple laminated stainless steel. This offers a strong cutting tools with a high quality finish. It's great for cutting, slicing and piecing even the toughest materials thanks to it's razor like blade. It is ready to take on any tough cutting job you have. The handle is made from Curly Birch and Antler handle. The handle has been crafted to a high quality finish offering a solid yet comfortable base to your knife.To top this comfortable handle it has finger grooves which not only helps you have control but also prevents contact between the sharp blade and your finger. The light wood makes this high quality knife great for all your cutting jobs or showing of in a display. Add this item to your basket & spend an extra £372.01 to apply for finance.